We consider a defaultable asset whose risk-neutral pricing dynamics are described by an exponential Lévy-type martingale. This class of models allows for a local volatility, local default intensity and a locally dependent Lévy measure. 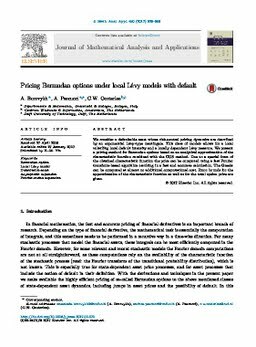 We present a pricing method for Bermudan options based on an analytical approximation of the characteristic function combined with the COS method. Due to a special form of the obtained characteristic function the price can be computed using a fast Fourier transform-based algorithm resulting in a fast and accurate calculation. The Greeks can be computed at almost no additional computational cost. Error bounds for the approximation of the characteristic function as well as for the total option price are given.